First off, we become connected to the traditional Irish music network. Those of us that participate in the music, dance and language workshops, céilí and set dances, and music sessions know the powerful meaning of the Comhaltas slogan ‘Ceol agus Gaol’ music and kinship. 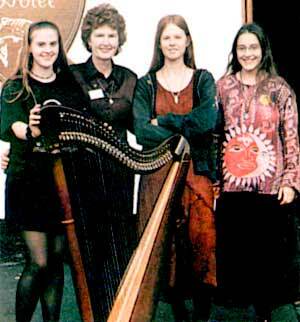 Many lasting friendships have been formed and grown through Comhaltas. We also receive quarterly issues of Treoir magazine. Treoir is a first quality journal that captures the history in action of Comhaltas and its members. There are features on music and dance, the personalities and events that make the music and dance come to life, and for those gifted in Irish, stories and articles in the Irish language. Moreover, the number of pages in colour has exploded over the past few years. And recently in North America, we have developed a way to have Treoir delivered direct to each authorised Senior Member’s home. Membership also allows you to participate in all Comhaltas activities, and for those that seek elected office at all levels, a chance to lead us with new ways to maintain and promote the aims of Comhaltas. Through membership, North America has direct voice in the Ard-Chomhairle (Central Executive Council), the policy making organ of Comhaltas that meets in Dublin. There are also financial discounts in the form of member rates at the North American Convention and Fleadh Cheoil na hEireann. And when in Dublin, member room rates at the Cultúrlann na hEireann, the Comhaltas HQ. The latter is a great place to enjoy a ceili or session and then just walk upstairs to your room. Another membership privilege is the opportunity to compete for the Aer Lingus Living Tradition Awards. You determine what school programme or course you want to attend to bring back teaching experience related to Comhaltas, and Aer Lingus provides the winners with the round trip flight to Ireland. What a great way to build up Branch teaching capabilities. These are great benefits and many of them have come about in recent years through the actions of the Provincial Council structure we have developed in North America in line with the guidelines for all of Comhaltas. This organisational structure does not come free and we have attempted to fund it from Convention proceeds and with an assessment system. The latter didn’t work very effectively. So, in San Francisco, your Delegates at the 1998 North American Convention voted to drop the Provincial assessment system, and instead, to modestly increase the dues on the Senior (First) member. All other dues categories will remain as they have been for over 15 years. We know that raising dues can sometimes be a cantankerous issue, even if it is only the Senior (First) membership that is involved. But, we believe that if Branch leaders will review how we have increased membership benefits, and note that the old dues, which remained static for over 15 years, don’t meet our needs, most members will want to stay connected to the traditional Irish music and dance network and gladly continue to provide financial support to the worthwhile aims of Comhaltas. I know that I for one will be glad to give up a jar, a cappuccino or an ice cream sundae or two to stay connected with my friends in Comhaltas. Thanks again for your support to Irish culture.